How did we get here today? The grand jury originated in medieval England. It was used in the reign of Henry III (1216–72) and it set the precedent for today’s common law. It is now an Anglo-American law, and a group of citizens that examines accusations against persons charged with a crime. They decide if the evidence warrants formal charges, on which the accused persons are later tried. The jurors, generally numbering between 12 and 23,are chosen from a panel. Only a majority is needed to charge or not. This process is the examination of witnesses, according to Encyclopedia Britannica. According to scholarly research, the grand jury was abolished partly in England in 1933 and completely in 1948. In the United States, the Fifth Amendment of the Constitution safeguards the right to a grand-jury indictment for serious crimes in federal courts.Although the prosecutor leads the charges, the grand jury has tremendous advantage at their discretion. Where the problem lies today is that many believe these jurors are nota representation of the community where these incidents occurred and the prosecutor can limit the amount of evidence he or she brings to the hearing, which has tremendous influence on the outcome. Consciously, or subconsciously, our biases can be the decider, and subjective lenses can easily become more important than the real evidence. Let us face it, the problem today is not the 12 to 23 individuals’ decisions. It is the lack of a much needed upgrade in many social justice applications and governance about how to fix it. This is not in the US alone, but stretched throughout the Caribbean, and other poor and developing countries where several outdated and barbaric ideologies have been a cancer that prohibits their economy from moving forward and bringing people together as it remains an up-hill battle. Today the world has tuned in and, this can be extremely hard to fathom by some who have seen several similar cases in their own local communities where hearts have been broken, and most evidence has little suspicion along racial lines but between haves vs. have-nots. In the end, the justice system is diminished. Sure, it is still easy to blame colonization and slavery in these poor regions. However, this argument is losing its footing because, centuries later, many are more educated, and hold major offices to make a difference. Therefore, leaders should be able at least to try to adapt, amend laws and move forward. Gardner, and earlier Michael Brown who were both unarmed black men, has forced another chapter that the society must tackle head on, despite how uncomfortable this issue can be. Many are now wondering if the discretion of a grand jury has a legitimate (and useful) role to play in criminal justice. Shortly after the decision, New York City Mayor Bill deBlasio said he shares this story on the same level as other African Americans. He stated that he literally has to train his bi-racial son on how to survive when he encounters a police officer. This story is not about them vs. us, nor poor against rich, it is an old application of laws that has run its course and one community sees as a platform that diminishes their existence and it must change for a better union. 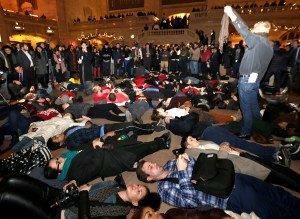 Today, we must us change course and the image that has emerged from the demonstration signs of frustration being held. 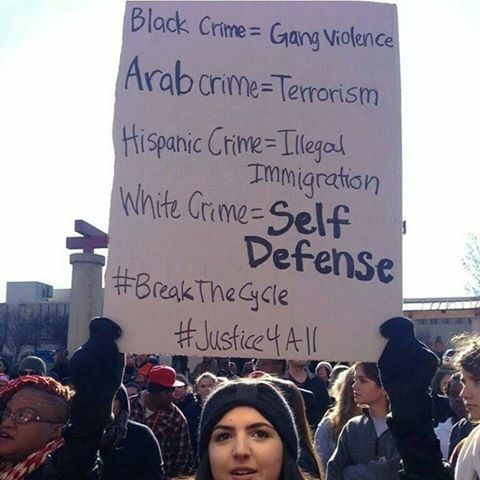 One read: Black Crime = Gang Violence, Arabs = Terrorist, Hispanic Crime = Illegal Immigrants, and White Crime = Self Defense. 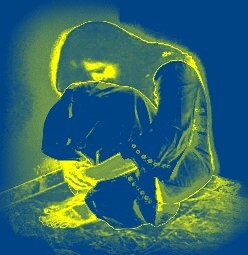 All crimes are wrong, and one should be held accountable. However, seeing this mindset for a democracy and a great nation on most socio-economic fronts, this has to change. 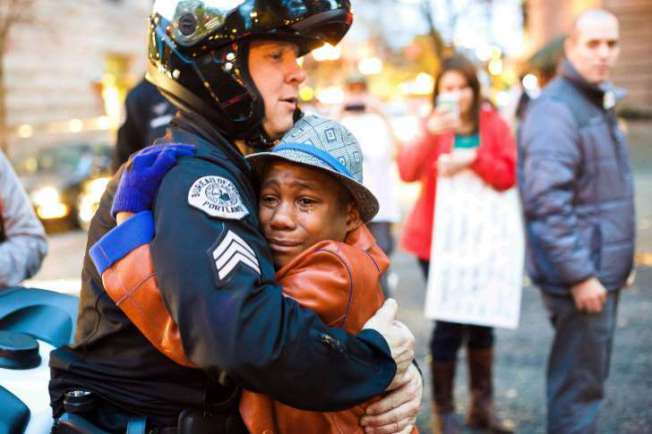 We need more images such as Devonte Hart, 12, who was seen at a demonstration holding a sign that said “free hugs” when Portland Police Sgt. Bret Barnum noticed him, motioned the boy over and the two began talking and later hugged. The picture reduced several to tears of joy. Despite these new volcanoes, officers can make a difference in our community. A majority are excellent servants, with their own families, while keeping the public safe. Our community needs police officers, and few bad ones on the job do not speak for all. These frustrations should not become a push to arm people with weapons to protect themselves, or to decrease the role of public servants. However, society has to discuss these problems in their totality, and not through the prism of a narrow focus, and overlook the rough edges in its path. Far too often, some opinion writers outside looking-in tend to see these issues as only black people’s fault, while linking high crime rates in their communities as a contributing factor. Even when statistics support such claim, this is not a Black History Month issue or just a problem in this community. One has to step back and ask, does that give the right to use the rule of law to create more polarization, hate, and intolerance? In today’s society, a 12-year-old boy should not have been shot, even if he may or may not have threatened when an officer approached. An officer is trained to step back and de-escalate. Sometimes we should put our ideology on hold and the perception of one zip code. As famous basketball player Charles Barkley said, some profiling is fine, and I agree, but after the whistle has been blown, and the penalty has been given, should everyone continue to dribble using the same old play? The decision has crossed many political and ideological lines. Furthermore, my black friends and I do not walk down the street and every Caucasian we run into gives us a revisionary history. “There goes our slave master?” In fact, “How’s life?” is more common, followed by a conversation. However, the systematic problems from history are not lost on our minds. 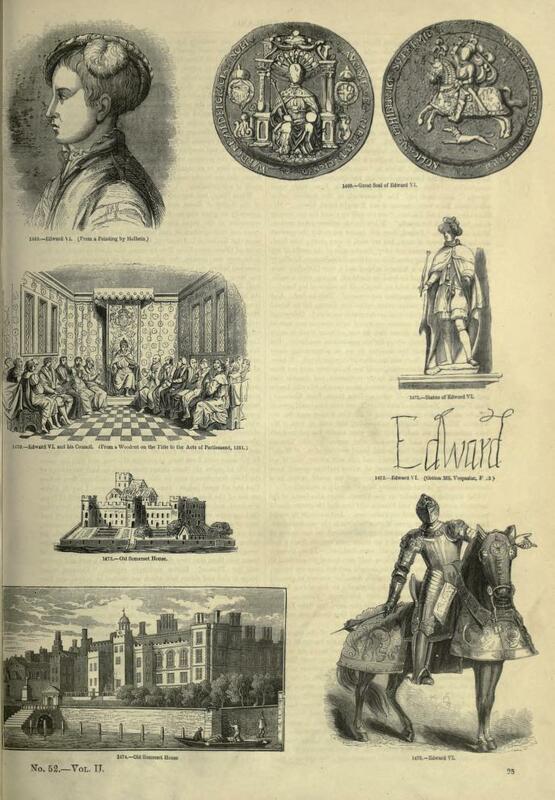 What many seek today is not different from the Grand Jury’s first foundation, created to prevent oppressive prosecution by the English crown, where the citizens’ have a hearing before real prosecution. Today, it seems a deviation has occurred, and it is now the opposite. As a society that is still molded in a racial and economic divide, it makes these events collide with perception and reality. This does not change overnight. An officer will continue use force as needed to apprehend a person who resists. Furthermore, they have to make decisions based on the situation they face. However, the debate today is not simply about these deaths, but a community trying change what is perceived as a culture and an environment stuck in the past, and not willing to move forward for a better union. The reality is that decades of an ideology are hard to reverse with a few television pundits’ opinion. Going Forward: In the next 50 years, many will look back and, despite the frustrations today, it seems the glass is half-full, hopefully, even if not filled in my lifetime, I believe that soon it will over flow and bring plenty for many who are hurting some balance. Despite our frustrations, and the questions being asked, please let us not forget that police officers put their lives on the line everyday to keep us safe, and we need them. ← Commentary: My rabbi is gay, now what?